Green has had a long career in education and taught at every level from elementary education to the university. He has taught extensively in different philosophical traditions, Religion and Culture, and the History of Ideas. He is also founder of the Philosophy Born of Struggle Conference Series, and Editor of Brill, the international scholarly publisher, special series on African-American and Africana philosophy. Jaima is a Visiting Assistant Professor in the Department of Philosophy at St. Lawrence University (SLU). His primary research interests are in Aesthetics and Africana Philosophy, and at SLU he teaches courses in these areas. He did his doctoral studies at SUNY Stony Brook, where his primary research examined the relationship between philosophy and literature, particularly with an eye to the ethical and political implications of the distinction. 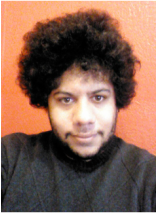 At our November meeting, Scott presented, "Malcolm, Nietzsche, and Violence"
Astacio is currently an undergraduate student at William Paterson University. His academic interests lie in Social and Political Philosophy with an emphasis on philosophy of race and Latin American Philosophy, as well as film and media studies. His areas of focus draw from his experiences as a second generation Dominican-American that has yielded particular interest in exploring race and identity. Rivera Berruz is an assistant professor of philosophy at William Paterson University. Her areas of academic research focus on Latin American philosophy, Latina feminism, and Philosophy of race. She approaches these topics of research at their intersections as she is committed to the importance of diverse approaches to philosophical praxis. Moreover, her dedication to these topics stem from an investment in exploring her own identity as a Latina in philosophy. Currently, her research explores the metaphilosophical question of Latin American philosophy, the concept of gender in the writing of José Martí, the concept of boomerang perception in Latina feminist scholarship, as well as the collaborative excavation of Carlos A. Cooks. Bright is a 4th year PhD student at Carnegie Mellon University. He primarily works on social epistemology, with a focus on using formal methods to understand how the social structure of science affects our ability to produce and disseminate knowledge. He has also published on both demographics of philosophy, and on intersectionality theory. Before attending CMU he completed an MSc in the Philosophy of Science at the London School of Economics in the Department of Logic, Philosophy, and Scientific Method. Liam is proud to be part of the international leadership team for the Minorities and Philosophy organisation. Sati is an graduate of the City College of New York, CUNY, where he majored in philosophy. His research interests are in political philosophy, particularly immigration, citizenship, political membership, and race – he finds these topics inextricably linked. His current work examines the plight of undocumented immigrants. In addition to arguing that undocumented immigrants should have opportunities to gain legal status, Sati’s work also seeks to comprehensively theorize about undocumented immigrants in the hopes that the debates and policies that affect undocumented immigrants are more attentive to their political situation. The hope is that future work will examine reforming global immigration schemes as a matter of racial justice, drawing on developments in epistemology and theorizing about marginalized groups. and Justice Studies Program at Fairfield University. She graduated from Spelman College in 2001, with a B.Sc. in Mathematics and a minor in Philosophy. She received both her M.A. and Ph.D. in Philosophy from The University of Memphis, and does research in the areas of Continental Philosophy, Philosophy of Race, and Postcolonial Theory. of race can be found in Levinas Studies, Research in Phenomenology, the Journal of the British Society for Phenomenology, as well as Continental Philosophy Review. Her book,Moments of Disruption: Levinas, Sartre and the Question of Transcendence, was published in December 2013 with SUNY Press. Her current book project is on the relationship between creolization and nationalism. Dr. Sealey currently serves as the book review editor of the Journal of French and Francophone Philosophy. She is also a member of the advisory board to PIKSI (Philosophy in an Inclusive Key Summer Institute), and of the Secretariat of the CPA (Caribbean Philosophical Association). She has also served as chair of the Committee of Racial and Ethnic Diversity at SPEP (the Society of Phenomenology and Existentialist Philosophy. At our April meeting, Sealey presented, "The Composite Community: Thinking through Fanon's Critique of a 'Narrow Nationalism'"